The meetings are held typically on the second Monday of each month between 10:00 and 12:00, although there may be an occasional change of date if there is a clash with another function. These changes do not happen at short notice. 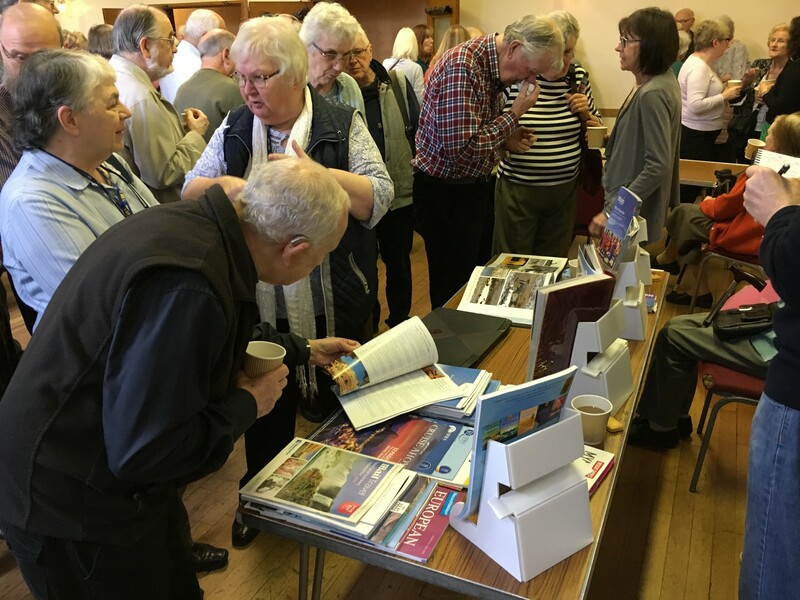 Members should just turn up at the Winston Churchill Hall, Bury Street, Ruislip before 10am on the second Monday in the month, enter the foyer and you won't be able to miss us. Thu Apr 25th Rambling Hayes along the Grand Union Canal, by Lake Farm, and through Stockley Park back to Hayes. Bus U4 goes from Uxbridge Station (Metropolitan & Piccadilly Lines) to Hayes Station (journey time 44 minutes approx. ), bus 140 goes from South Harrow (Piccadilly Line) to Hayes Station (journey time 40 minutes approx.) or from Northolt Station (Central Line) to Hayes Station (journey time 32 minutes approx). Central line to Eailing Broadway (via North Action) then change to GWR overground to Hayes and Harlington (Freedom Pass can be used on GWR to Hayes). Walk: A circular walk from Hayes alongside the Grand Union Canal, passing by Lake Farm, and through Stockley Park then back to Hayes Station. Lunch: At the Arena in Stockley Park where there is a café and toilets. Mon Apr 29th Social Coffee Morning at THE GOOD YARN in Uxbridge where you can meet up with other members. In association with Hillingdon Guided Cycle Rides, Hillingdon U3A have arranged another free guided Cycle Ride. Meet at Rusilip Station early evening with your bike. We will cycle the short distance to Pinn Meadow and meet a member of the Hillingdon Green spaces team for a talk on local bats. Note that bike lights will be needed for this ride. (Sorry but no bike loans are available for this event). Distance: will be a short 3 mile ride with lots of stops during the way to spot the bats. The ride ends back at Ruislip Station. Speed : The group will go at the speed of the slowest rider. Contact : Contact Patricia via email to creakpatricia@gmail.com to book a place as space is limited to 12 places. Does your bike need a little TLC, why not take it along to one of the free Dr Bike sessions run by Hillingdon. Next one is Saturday 30th March at Highgrove pool then Saturday 6th April at Botwell leisure centre Hayes. Check the Hillingdon Dr.Bike Website for more details. Cost £8. 45 places available. Make your own way to meet inside the Cathedral at 10:45am. Nearest Underground Station is London Bridge. Includes a 90 minute tour during which we will discover the Cathedral’s long and varied history. Contact Janet Perry for more details. Peter and the Wolf 7:30pm, Cadogan Hall. - Prokofiev Peter and the Wolf in a youthful take on orchestral music. - Tony Britten with a new commission for outreach project Music Junction. Price includes transport by Community Bus. As at the February meeting, 3 places were still available. If you want further details or to apply, contact Elizabeth Douglas. Mon May 13th Meeting Monthly Meeting at WCH - AGM - Presentation: "All Things HU3A History"
Cost £28.50. 53 places available. Coach trip, pick up Ickenham 9.00am & Uxbridge 9.15am (Return approx. 6.00pm). We will have a guided tour of the Grade 1 listed lakes and gardens which date back to the early 1800s and have recently reopened after being closed for 10 years. There will also be some free time for you to enjoy the gardens on your own. Wed May 22nd London Walks Diamond Studded London, Meeting at Chancery Lane Underground Station, exit 3 (Central Line) at 10.45 am. The cost is £8 per person. Contact Brian Carse for more details and to be added to his list. Watch this website or check the next Newsletter for updates and all future events. Cost £10. 40 places available. Make your own way to meet at Royal Festival Hall at 10.45am or Waterloo station at 10.30am. Explore the history and architecture of this world-famous arts centre on the South Bank. Find out how 67 years of history has shaped Southbank Centre’s iconic landscape and learn more about the inner workings of its buildings with a special focus on the history of the 1951 Festival of Britian. Contact Maureen McCann for more details. Mon Jun 10th Meeting Monthly Meeting at WCH - Presentation: Warren Ashton - "Metaphors, Cliches and Sayings. Avoid them like the PLAGUE"
Description: Manon Lescaut by Giacomo Puccini. Starting at 7:30pm, this is a new production with the City of London Sinfonia and the Opera Holland Park Chorus. In the cruel and glorious opera that made Puccini’s name, a convent girl becomes a courtesan, then a convict, forever unable to choose between a life of luxury and a life of love. This price will also depend on having 16 committed signatures or the cost per person will change. Places are still available. For more details contact Elizabeth Douglas. Also watch for updates in the Newsleters and this web site. Summer Serenades 7:30pm, Cadogan Hall. ** All places are now filled. ** If you want to be added to the waiting list or want further details contact Elizabeth Douglas. Description: Un ballo in maschera by Giuseppe Verdi. Starting at 7:30pm, this is a new production with the City of London Sinfonia and the Opera Holland Park Chorus. Based on the story of Gustav III, the Swedish king who was murdered during a masked ball. 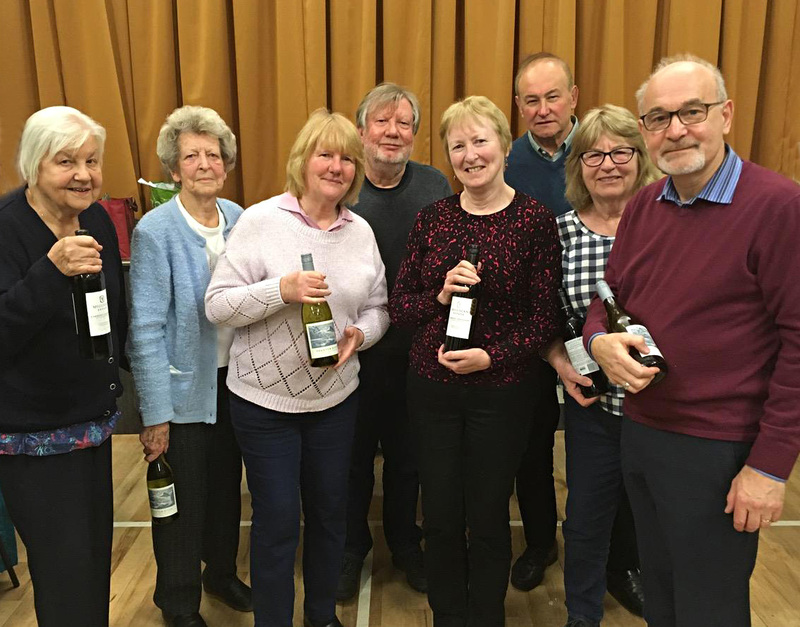 Mon Jul 8th Meeting Monthly Meeting at WCH - Presentation: Ian Keable - "Charles Dickens - Conjuror"
Thu Jul 18th Theatre Visits Private Lives at The Mill, Sonning Theatre at 2:15pm, the Matinee show. Written by Noel Coward, it's set in 1930 in Deauville, France. After a tumultuous and fiery marriage, divorced couple Elyot and Amanda find themselves in adjacent suites while honeymooning with their new partners, Sybil and Victor - explosive and hilarious consequences. The trip includes the coach, a 2 course lunch with coffee, the matinee performance and a programme between 2. Coach pickup will have to be around 11:00am but final details will be available before the event. Contact Jill to register your interest. Mon Aug 12th Meeting Monthly Meeting at WCH - Presentation: Tony Eaton - "Invasion 1940 - What If?" Mon Sep 9th Meeting Monthly Meeting at WCH - Presentation: Phillipa Radford-Hancock - "British Red Cross - Past, Present and Future"
Mon Oct 14th Meeting Monthly Meeting at WCH - Presentation: Rev Ken Tombs - "Trinidad to Havana"
Mon Nov 11th Meeting Monthly Meeting at WCH - Presentation: Howard Slater - "Audrey Hepburn growing up in WW2"
Mon Dec 9th Meeting Monthly Meeting at WCH - Presentation: Tricia Thompson - "Love Me Tender - The Life and Music of Elvis"
Mon Jan 13th Meeting Monthly Meeting at WCH - Presentation: Richard Shelby - "The Women I Have Married"
Mon Feb 10th Meeting Monthly Meeting at WCH - Presentation: Ronald Koorm - "Outstation Eastcote"
Mon Mar 9th Meeting Monthly Meeting at WCH - Presentation: Ant Grant - "Another Omelette, Mister Gielgud"
Mon May 13th Monthly Meeting at WCH - AGM - Presentation: "All Things HU3A History"
Mon Jun 10th Monthly Meeting at WCH - Presentation: Warren Ashton - "Metaphors, Cliches and Sayings. Avoid them like the PLAGUE"
Mon Jul 8th Monthly Meeting at WCH - Presentation: Ian Keable - "Charles Dickens - Conjuror"
Mon Aug 12th Monthly Meeting at WCH - Presentation: Tony Eaton - "Invasion 1940 - What If?" Mon Sep 9th Monthly Meeting at WCH - Presentation: Phillipa Radford-Hancock - "British Red Cross - Past, Present and Future"
Mon Oct 14th Monthly Meeting at WCH - Presentation: Rev Ken Tombs - "Trinidad to Havana"
Mon Nov 11th Monthly Meeting at WCH - Presentation: Howard Slater - "Audrey Hepburn growing up in WW2"
Mon Dec 9th Monthly Meeting at WCH - Presentation: Tricia Thompson - "Love Me Tender - The Life and Music of Elvis"
Mon Jan 13th 2020 Monthly Meeting at WCH - Presentation: Richard Shelby - "The Women I Have Married"
Mon Feb 10th 2020 Monthly Meeting at WCH - Presentation: Ronald Koorm - "Outstation Eastcote"
Mon Mar 9th 2020 Monthly Meeting at WCH - Presentation: Ant Grant - "Another Omelette, Mister Gielgud"
Mon Apr 29th Coffee Morning at THE GOOD YARN in Uxbridge where you can meet up with other members. Wed May 22nd Diamond Studded London, Meeting at Chancery Lane Underground Station, exit 3 (Central Line) at 10.45 am. The cost is £8 per person. Contact Brian Carse for more details and to be added to his list. Thu Apr 25th Hayes along the Grand Union Canal, by Lake Farm, and through Stockley Park back to Hayes. Thu Jul 18th Private Lives at The Mill, Sonning Theatre at 2:15pm, the Matinee show.